Fred Feddersen is a rifle barrel maker on a mission to do something that's never been done before: create a production barrel that can shoot successive bullets through the same hole, using an inexpensive semiautomatic rifle, not a bolt-action Olympic race gun. Fred Feddersen shows off a part presence sensing system he devised for his new gun drilling system. To reach his goal, he first had to accomplish a number of equally challenging feats in metalworking. He developed new ideas in gun drill design to achieve greater straightness. He invented and patented a new whip-guide stabilizer for gun drills and reamers. He push reams small diameter holes with his own proprietary tool design, capable of 0.0001" accuracy. He uses proprietary carbide formulations for his rifling buttons. And he is using the world's most advanced tube hone from Sunnen Products to impart accuracy-enhancing bore geometry and diameter (plus/minus 0.000050" end-to-end), with a fine finish of 3-8 microinch Ra that sheds fouling and copper bullet-jacket residue. The hone's servo-spindle also serves as a quality check on reaming, with its extreme sensitivity to spindle load detecting -- and correcting -- tight and loose spots that escape most air gages, Feddersen says. 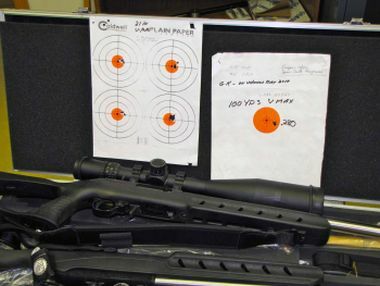 Feddersen has ample evidence of his success in a binder full of targets with near-single-hole, 5-shot groups fired from 50 yards using a semiautomatic Ruger® .22 magnum rifle equipped with his barrels. Shooters familiar with this rifle and cartridge "know" this accuracy is not normal, but Feddersen takes barrel making beyond what's known. A series of targets with a pair of Ruger .22 magnum semiautomatic rifles equipped with Feddersen barrels. Targets on left are 5 shots each at 50 yards. Target on right is 5 shots at 100 yards. After a decade of development, he is also experiencing excellent uptake from firearm OEMs. More important, his company's capabilities have earned it a role as supplier of choice for barrels used on U.S. military sniper rifles in .50 caliber BMG (Browning machine gun) and .338 Lapua magnum. Fred Feddersen is a design engineer and inventor with boundless curiosity and drive who does not accept current limits on any technology, whether it is welding or bottle blowmolding. His varied interests and career moves have led him to learn Morse code, pass the FCC exam, earn seven welding certifications, and become a CNC programmer and CAD/CAM engineer. Some of his most widely used inventions and patents were developed for blowmolding PET bottles. After exceptional success in that industry, he sensed a market opportunity about 10 years ago to make ultra-accurate rifle barrels on a volume basis for military and commercial use. After studying the art and science of custom barrel making, closely examining the industry's best barrels and acquiring high-quality machine tools, Feddersen launched RFour, Inc. During the first years, he spent much of his time and effort pushing past the known limits of barrel manufacturing technology to achieve his goal, starting with improvements in gun drilling and reaming. He stressed that what he's learned about barrels applies to similar tube-type products that require very small holes (down to 2 mm) to be reamed or honed. These include stents (prior to laser cutting into spring formations) or water-jet cutting nozzles. The latter must be free of internal surface micro cracks, so can be honed down to base metal in a process similar to that used for high-pressure diesel fuel rails. Honing perfects hole roundness, particularly with the finer abrasive grits. A rifle barrel should begin with the roundest, straightest, smoothest hole possible, according to Feddersen. "Of the three hole making steps for a barrel, gun drilling and reaming are most critical, because honing results will be affected by reaming quality, and this is most critical with long, small holes," he explains. "The reamer must control diameter all the way through to optimize the honing process." Feddersen starts with stress relieved 4150, 416SS, MIL-S-46047 (a special alloy with extra vanadium) or MIL-S-11595. "Straightness of the drilled hole has a profound effect on accuracy, though it is not fully appreciated in the industry," Feddersen explains. "If a mach 1 bullet passes through a curve in the rifle barrel, even a curve that's a quarter-mile in radius, it will cause vibration. All barrels have banana-shaped bores; less than perfectly straight. You can prove this by rotating a rifle's barrel 180 degrees between shots and you will see as you rotate it that the bullets shoot in a circle. The smaller the radius of the curve, the bigger the circle. This matters less with small caliber bullets than with the heavier .50 caliber slugs, but it is always a factor." To push straightness beyond the accepted norm for gun drilling runout, Feddersen developed new ideas on drill design, and invented and patented (No. 7,207,751) a new whip guide stabilizer. Feddersen's patented whip guide stabilizers used on DeHoff gun drill. "When you push a gun drill, if the tube size is standard, it can bend so the drill tip rolls onto its back taper, and the drill will try to steer crooked," Feddersen explains. "To limit this, we specify a tube only 0.005 -- 0.007" smaller than the drill diameter, because the tube can then bend only a couple of thousandths off center. By keeping the tube diameter very close to the diameter of drill tip, it greatly limits tube deflection and maintains a straighter drill path. Using these design parameters, we can drill 2000-4000 inches in 32 Rockwell steel at 1.5 to 2.5 inches per minute on one sharpening, and keep our runout under 0.0005 per inch or under 0.016" TIR, end to end, on 36-inch .50 cal. barrels." Feddersen's goal with honing is elimination of radial reaming marks and perfecting the roundness. 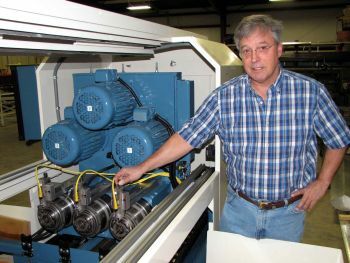 "The Sunnen HTC tube hone is key for honing small caliber barrels efficiently and precisely, with servo control of three axes: spindle, tool feed and stroking," Feddersen says. 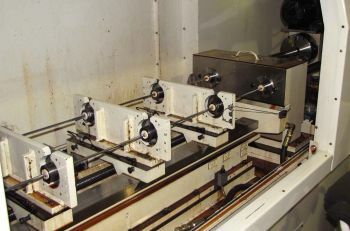 "It has a 1.5 hp servo spindle motor so sensitive you can create 50% load just by putting your fingertips on the tool shaft. There's only a handful of these machines in the U.S. We hone only on the pull stroke. The servo feed system expands the tool very rapidly at the start of the pull stroke, then retracts it quickly to take load off before a rapid move forward to the start point. It's unique to this machine. "Elimination of reaming marks gives the best groups, there is no doubt in my mind," he continues. "Honing improves smoothness, straightness and roundness, eliminating even the tiniest high spots. If the reaming is not perfect, the torque sensor on the hone immediately senses it. These are high spots that cannot be detected by lapping or reaming. Air gaging, depending on the gage, may not be able to detect it. After honing, our roundness is down to a point where a tenth-reading dial bore gage barely flutters." Smoothness also improves the barrel's cleanability. "The lower the Ra, the easier the barrel is to clean." Feddersen says. "When copper settles in the valleys of reaming marks, it will not come out without a solvent." 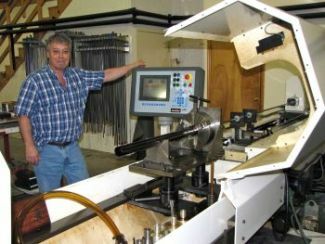 Fred Feddersen with the Sunnen honing machine being set up with a .50 caliber rifle barrel. Honing perfects hole roundness, particularly with the finer abrasive grits. "The finer the grit, the rounder the hole becomes," Feddersen says. "We typically use 600 and 1200 diamond grit, and will go to 1800 in some cases. Lapping will not fix roundness, while honing can. A bullet needs to spin perfectly on center when it exits the barrel, and a bullet passing through a non-round barrel comes out non-round and cannot travel perfectly straight." A perfectly round hole in the workpiece also gives the best results when adding cut or button rifling. "If the hole is suddenly 5 tenths smaller or larger in part of the bore, the action of the cutter or button will be affected," he explains. Feddersen button rifles his barrels with carbide buttons made to his specifications for the material formula and profile. Final steps include contouring the OD, chambering and fluting, followed by optional stress relieving, lapping and other proprietary steps, per the customer's order. As Feddersen explains, lapping produces the ultimate in smoothness, softens all sharp edges and leaves a final surface finish with a linear, rather than radial, pattern to it. 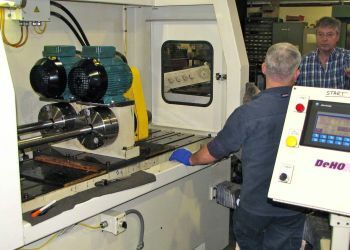 If the need for additional manufacturing capacity is a measure of success in reaching his goal, it is worth noting RFour recently acquired two new 3-spindle gun drills, a second heat treating oven, and an automated cut-to-length/chamfering machine that can produce five barrel blanks per minute. To view Feddersen's videos, click below.